Guinea fowl eggs take 28 days to hatch. In the wild they will usually sit on about 12 eggs per clutch. You may decide, if you can get any of the eggs that you leave half under your guinea hen and put half in the incubator or under a broody hen. I have read that in the wild guinea fowl make great parents. They don’t like to sit on eggs in an aviary or a hut and I know from experience that if I try to put a run over my sitting guinea hen to protect her from predators she normally gets off the eggs. 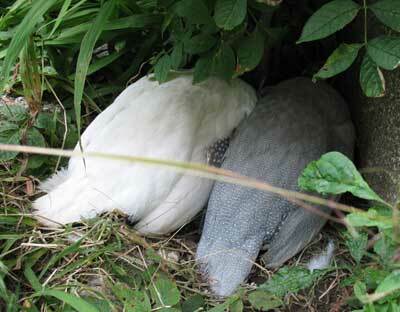 Guinea fowl should sit if they feel secure and hidden away. My advice if you want your guinea hen to continue to sit is to try not to disturb her but make sure that she is well hidden and protected from predators. A couple of farmingfriends have hatched my guinea fowl eggs under broody hens who looked after the keets very well but I am not sure if the guinea hen throws the keets out of the nest. I imagine that if a guinea hen goes to the trouble of sitting on the eggs until they have hatched then she will look after the keets as well.I have only ever managed to hatch guinea fowl out using an incubator. When my guinea hens start to sit outside and I place a run over them it usually disturbs them and they get off the nest. This has happened 3 times this Summer already. I hope this information is useful for you. Let me know how you get on. If anyone has any advice for Thelma regarding guinea fowl sitting and hatching guinea fowl eggs then please leave a comment.